Three months into the year can only mean it’s time for my quarterly update on reading challenges! A good start to the year, although I think I must have read these in a clump–it felt like I was doing constant Newberys for a while, yet it’s not actually that many for the year yet! Welcome to a bright and shiny new year! There are wide empty metaphorical bookshelves to be filled with this year’s reading, so let’s dive in to new plans. It’s probably no surprise I’m returning to this one. It went very well last year, and besides–now I feel invested. With 41 to go, I can’t quit on this list now! Not every book on here has been good, but I’m intrigued by what they all are and I like the challenge of reading down a specific list. Now more than ever, this feels important. I’m setting the goal at 20, which is what I read last year, and hope to exceed. I may expand this to minority groups of categories other than race, but we’ll see. For the moment, I’m looking for books–recommendations of titles or helpful lists very welcome! This was my favorite of the many parallel universe novels I read this year, with one of the most fascinating and best put together concepts. I loved the deft handling of the timey-whimeyness of it all, and the clever, practical ways Harry and his friends handle something as utterly bizarre as reliving your life over and over. No (good) Marissa Meyer romance to sweep this category this year, so I’m splitting it between two parallel universe ones. Addie and Trevor are a sweet couple who manage to find each other twice in Kasie West’s two-book series, and I liked Hannah’s romance with childhood sweetheart Ethan too, especially the ways their young romance had influenced their later lives. I didn’t like Hannah’s alternate life romance as well, complicating the overall book, but half the story had an excellent romance. Not an epic figure, Hazel is an ordinary, socially-struggling girl who has to deal with an extraordinary (fantastical) situation and I just loved her. It also doesn’t hurt that she looks at a snowfall and thinks it’s too deep for a tauntaun (a la Star Wars). I actually did not start and finish any new series this year–or even read more than two books in a new series. So I’m giving this one to two beloved series that I finished this year–I think. Unless Hines comes back for Book 5. I’m never quite sure with him! A very cool book, McGonigal combines life goals with game theory, and explores how to gamify, say, a commitment to eat healthy–and why it can really help to do so. I highly recommend her TED talk on the subject, which sent me to the book. A strong contender for best nonfiction, this look behind the scenes at the making of The Princess Bride is simply delightful. It’s read on audio by the marvelous Cary Elwes (Dread Pirate Roberts himself) with generous use of audio interviews with other castmembers. The sly narrator’s final farewell…I underlined a good two pages, and it may well be the best single passage I’ve ever read. Granted the bar was set high–but this book really was a mess, from the wish fulfillment, conflict-free author storyline, to the badly-written novel-within-a-novel. I just…don’t even know. Meyer has landed on my best-of list repeatedly, making the iffy-romance, bizarre character arc and thematic disaster of this book especially, well, disappointing. And angry. It kind of made me angry. I picked this up at random at the library because, hey, Albom, why not. And then it was surprisingly wonderful, deep and engaging. I don’t always love Albom but he has his moments, and this was one them. I know, I know–but I really never read this as a kid. I started it several years ago and couldn’t get into it. I’ve had a friend badgering me (nicely!) to read it for a couple years now. And I finally did. I still don’t get all the “thee’s” and “thou’s” in here, but I liked it! Because, you know, Pratchett. This could go to either Thud! or Maskerade which were really my most hilarious ones, but those are rereads. So it goes to the short story collection, mostly for the story involving Carrot investigating a murder by Punch and Judy puppets, and a long story about Granny Weatherwax deciding to be nice (it goes badly). I loved reading the very first parallel universe story. It’s not often you get to read the beginning of a genre. Plus, Leinster was incredibly prescient in many ways which was just very cool to read. I reread this one after many years and the book was good, but didn’t blow me away–except for one story-within-the-story that I remembered vividly, thought of often, and really liked…without remembering that it was in this book. It’s a story very near the end, about a man with two sons, one of whom will speak words that will be remembered for millennia. It’s not the expected one–but we all have a role to play in the cosmic story, and often we don’t know what it is. I love that. A conundrum: there’s no Fairyland book to look forward to! I’ve also quite dropped off in tracking upcoming books, in part because I’ve finished a lot of series recently. Well…maybe Robin McKinley will finally release Pegasus 2? Or Tamora Pierce will give us the long-awaited next Tortall book? I’ve been looking forward to those for…quite a long while now! And that’s the story for another year! What was your best read in 2016? Or do you have a book to fit any of the other categories? I’d love to hear about it! We’re coming up on the end of a very long, very strange year, in which I did a lot of reading. So let’s get down to it! I continue to do better with the Newberys than I did in the first quarter, in terms of enjoying the books. I’m also racking up large numbers of these. It helps that they’re relatively easy reads, and also that they tend to be brilliant for audiobooks. I try not to do anything too intense or complicated on audio (driving, you know) so children-friendly Newberys have gone well that way. Just for fun, this quarter I thought I’d note the year of the Newberys I’ve read. I need to work on the earliest ones still. Maybe next quarter! I’m on track right now to exceed this goal, with so many really interesting parallel universe stories. I’m fascinated by how different these books can be, while all being within what I thought was a fairly narrow criteria! I did not do as well on this challenge this quarter. 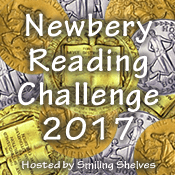 But I’m still on track, and I managed a few double-challenge books by reading Newberys with minority leads. I’m actually a little sad to be on track, though…I was hoping 18 books was a low bar, and I’m coming to the conclusion it wasn’t! Sadly, not much Shakespeare this quarter, although while on vacation I went to see a live play at the Globe theatre…that counts double, right? 😉 I’ve exceeded my low goal, not feeling strong about my stretch goal, but will hopefully get a bit more of the Bard in before year’s end. Carl’s Seasonal “Challenges”: Readers Imbibing Peril somehow began three weeks ago when I wasn’t paying attention… Focused on horror, this one never fit my reading interests as well as the others, and I’m sitting it out this fall. Back onto these with the Sci Fi challenge in a few months! How has your reading been going for 2016? Are you pursuing challenges? How are they going? I’ve been enjoying these more this quarter, having hit several good ones. My faith is becoming restored in the Newberys! Suggestions are still welcome though. I continue to have a wonderful time with parallel universes and parallel lives, and have managed to break out of the YA universe that marked my first-quarter reading. I’ve made some good progress here as well, and happily, I’ve actually managed to stumble on more non-Caucasian protagonists by pure chance! Four this time, a big jump from the single one in the first quarter of the year. I’m still hoping to review a few more of these than I have so far, but here’s the current list. I’ve lost sight of Mr. Shakespeare a little this quarter, compared to the other challenges, but I did fit in a couple movies. Hopefully, more to come later in the year! Carl’s Seasonal “Challenges”: We just finished out the Once Upon a Time Challenge, which I reported on last week!